We cannot communicate w. the upper force (Creator) because we’re opposite to it in qualities. Hence we cannot understand or feel it, there’s no contact. We need an intermediary degree that connects us. This is the degree of #Binah that connects #Malchut to #Keter. Creator & creature, giver & receiver, r polar opposites. To unite them you need an intermediary quality connecting them. For 40 years Moses absorbed the qualities of Machut/Pharaoh/ego, & another 40 years for qualities of Binah. He is the “loyal shepherd” of the ego to correction. Man is opposite to the #Creator. To receive from the Creator the force of #correction, you need an intermediary w. the qualities of both creature & Creator (Moses). This function is done by the Group: separately, receiving egoists, but collectively bestowers, connected to Him. The Creator awakens the quality of reception in us. We have to ask for the quality of #bestowal! Building the group, I’ll be able to turn to the Creator because together is trying to unite, bestow, rise above personal ego. That’s how we influence Him with the group – ten – #Minyan. #Solutiontocrisis The more the world and its crisis develop, the more everyone will blame Jews for all the world’s problems. It’s because the positive force comes into our world only via Jews. The nations feel this, while Jews, in spiritual descent, do not. The solution is in us! Adjacent spiritual states are always opposite to each other, following from the 4 phases of Direct Light, in sensation, knowledge. This is why it’s difficult to get used to changing spiritual states! Fast adaptation to a new spiritual state lies in lowering your head and letting it happen! In man’s mind, there is knowledge of the current degree. But at the same time, he has to anticipate the next degree, imagine it as standing above his present knowledge, as “faith above reason,” the next degree of his knowledge. He must tread from #faith to #knowledge! #Passover is liberation from egoism, sensation of this world, and the start of a new life, sensation of the upper world. Only the #Creator Himself can do this to us. But we have to become convinced that it is impossible to come out of egoism on our own and ask the Creator for it. #Joseph in the field: man lost his way in life and asks how to find his brethren to reveal bestowal and love in unity, and in them—the Creator. But they do not want to be close to him, the evil of egoism/Pharaoh becomes revealed, they come out of it (Egypt) and receive #Torah. 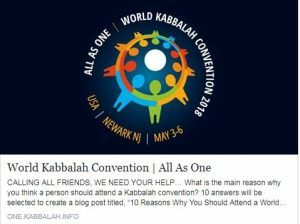 Why Should You Come To A Kabbalah Convention Invitation? 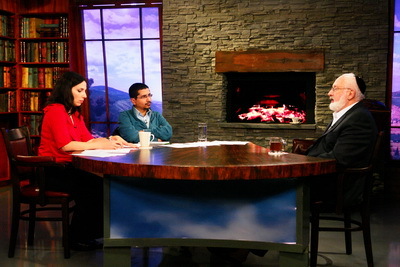 Since we’re in a state where the wisdom of Kabbalah is becoming more and more widely recognized, not as it has been popularly misconceived throughout history, as religion, mysticism, magic or philosophy, to name a few, but as a substantive method through which we can upgrade ourselves and the entire world. Kabbalists advise us to unite in groups that will become a model of mini-humanity, mini-Adam, because then the laws of communication will work between people like it used to be before Adam HaRishon’s sin. And in this way, we will attract the upper Light, which will influence us even more and unite us. We seem to want to leap forward in time. By the natural course of evolution, the upper Light will pressure us and unite us together in only a few hundred years from now. And we want it to happen right now! That is why we perform all the actions that are required of us, like little children who play and develop by playing the game. And in a similar way, we want to build a group in which the laws of the end of correction are realized. The Light influences the group in response to our efforts, we compel it. According to the laws of nature, we awaken the upper Light to influence us more and move forward to the extent of our efforts and the strength of our desire. So, we speed up the time of our development. This is the essence of the method of Kabbalah. The desire to love your neighbor as yourself, which is the law of the end of correction, becomes our daily goal. It is difficult for us to imagine what the world of Infinity is because we look from the side of the vessel and perceive infinity as an infinite desire. But in spirituality, in contrast to corporeality, infinity is considered a filling not restricted in any way. If the glass is filled to the brim, it means that there is infinity inside it, even if it is only 200 grams in size. The vessel does not limit its reception of the Light; that is, it does not indicate to what extent it agrees to receive, and not more beyond that. Therefore, both small and large vessels can contain infinite filling if they do not limit the Light, but receive everything they can fit into them. There may be a small vessel in a state of infinity, and another, more than a million times bigger, will be limited. After all, everything is evaluated relative to the vessel; if it does not place a limit on the reception of the Light, then it is limitless. There may be only ten grams of desire in you, but you do not limit the filling. Hence, you are in Infinity and your feelings are unlimited. Or perhaps, instead of ten grams your desire has grown to ten tons, but you cannot receive more than half of it. It turns out that the ten grams is the infinite filling, and the five tons is a limited one. Everything is evaluated with respect to the person who attains. In the “Introduction to the Book From the Mouth of a Sage,” Baal HaSulam writes: “It is known from books and from authors that the study of the wisdom of Kabbalah is an absolute must for any person from Israel. … if one studies … but has not learned the wisdom of Kabbalah, he must reincarnate into this world to study the secrets of Torah and wisdom of truth. ..
“You can therefore see the utter necessity for anyone from Israel, whoever he may be, to engage in the internality of the Torah and in its secrets. Without it, the intention of Creation will not be completed in him. It is our duty to make this last effort and spread the wisdom of Kabbalah, the method of correction of the souls that descend into our world at this time. These are the smallest, lowest, and most insignificant souls. But because of their insignificance, they will give out the greatest Light after correction. Here, the law of inverse relation of desire and Light operates. That is why it is the lowest desires that exist in our world that should give out the greatest Light, which will correct all souls, connect them, and give them one common Light impulse from which they will all unite. Question: Are the souls that recirculate in our world all the time the same souls? Answer: No. Sometimes there are also renewals and conjugations of souls, their mutual merging and division. It is very complicated. Just as in a living organism: cells, liquids, and systems are constantly mutually replaced and transformed. This can only be grasped in feelings. When one reveals the whole system, he begins to see what happens in it. And it can be revealed only if a person constantly tries to imagine that everything that happens in it comes from the Creator. As of today, it is fashionable for celebrities to lead the nation because the entire public is frivolous. People grow up on the Internet and are followed by a supportive public, but what does this really mean when the Internet is full of inferior content? It would be more useful for business people to manage a nation like a business with educators by their sides who would bring the society forward. A true leader is built on a good story that he believes in so that he is able to convince others that what he is talking about is possible and useful.